Insurgent is the follow up to Veronica Roth’s debut smash, Divergent. If you haven’t read the first book then stop reading this now as it does contains spoilers for the initial story. You can find my review of Divergent here. Hurtling away from Dauntless, Abnegation, Erudite and Candor towards the promised haven of Amity, Tris finds herself reeling from the events she has been entangled in. Mourning the loss of her family and struggling with the consequences of her own actions she is barely able to keep her head above the waters of her grief and guilt. Unable to succumb to her emotions she finds herself at the centre of the warring factions, Divergent As she and Tobias try to reach the truth at the heart of the hatred between factions, they find themselves drawn further into a world seemingly built on secrets and lies and must find limitless reserves of strength in order to face the revelations ahead. conflicted and confronted by violence, deceit and betrayal at every turn. The Tris of Insurgent, quite frankly, is a bit of a mess. The events at the end of Divergent have left her entirely undone and her Abnegation upbringing does not seem to allow her to unburden herself on anyone – nor does her all consuming guilt with regards to the death of Will. Unable to confide even in Tobias, she retreats into a stubborn shock, every act tinged by her inner battle. She is, without realising it, losing the will to live and this effects her decision making process – leading her into positions that are dangerous and a life that is heading towards isolation and loneliness. However, the old Tris is still there – her focus and attitude almost unchanged, if a lot more reckless. As in Divergent, she’s not always likable; in fact she spends much of Insurgent being downright unlikable but she is so clearly suffering that her odd decisions and secretive attitude are always understandable and one cannot help but to root for her and those she cares about. Tris’s PTSD (or whatever) effects everyone around her, with Tobias being right in the firing line. Except that rather than taking everything out on him she withdraws into herself. Tobias is an exceptionally well written character, strong, dangerous, broken, soft – a well-crafted kaleidoscope of paradox. In Insurgent he’s dealing with a lot of his own issues from the re-emergence of his brutal father to his conflicted feelings regarding Dauntless and the Factions in genera, never mind his somewhat mentally compromised girlfriend. His relationship with Tris is particularly well drawn encompassing both tenderness and frustration. They are both extremely stubborn and this leads to realistic conflict at several points yet their relationship is, at heart, solid. It is refreshing to read about a relationship in YA that requires hard work and compromise and Roth has written Tris, Tobias and their interaction extremely well. In fact, as a core group of main players start to emerge in Insurgent the complex and shifting relationships portrayed are beautifully expressed with each and every character handled with as much care as the main protagonists. Peter is particularly interesting with Caleb, Lynn and Tori not far behind in terms of both plot and characterisation. In terms of story, Insurgent picks up less than an hour from the end of Divergent. Instantly readers are plunged into Amity and over the course of the book Roth expands the world she so carefully created in the first title, with each Faction (not to mention the Factionless) coming into full focus. The story is often confusing, as the characters move from Faction to Faction, picking up conflicting information and trying to piece together the truth. This could easily have been the downfall of Insurgent – it’s not always easy to follow – but in actual fact emerges as its strength. With each Faction, each and every character driven by their own motivations and with different endgames in sight it is often impossible to know who to believe. While there is a lot of misinformation floating about, at its heart there is a blinding truth and Insurgent ends with revelations that are both shocking and vaguely nonsensical – yet utterly compelling. Roth’s writing takes no prisoners. Divergent was an exceptional debut and Insurgent is a worthy successor but readers should not expect an easy read. The book is relentlessly bleak and what glimmers of light do manage to shine through the overwhelming murk are few and far between. Yet this is exactly as it should be. Tris, Tobias and their society as a whole are waging war with each other and with themselves and the characters and storyline of Insurgent reflect this with brutal accuracy and force. In short, it’s all a bit depressing – yet as a story it has real integrity and Veronica Roth should be congratulated for writing conflict in the stark manner that it necessitates. Certainly, readers will not be disappointed in Insurgent – it’s one of the best titles out there at the moment and next year’s finale cannot come quickly enough. Highly recommended. 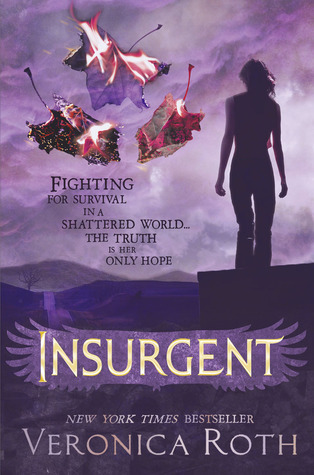 Insurgent is available to buy today. Thank you to the publisher for sending me this title to review. This is such a fantastic review, really analytical. I think you got Tris and Four and their relationship really spot on. I didn't actually find Tris THAT unlikable, but I can see how others would. I really enjoyed reading this!